DeckTape is a parchment-like texture tape made of fusion bonded fabric polyester fibers laid random orientation. It exhibits a high tensile strength, good elongation and a low profile. 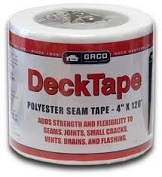 It will add strength and flexibility to seams, joints, small cracks, vents, drains and flashings.